Mr. KaziHarun-or- Rashid came from a noble family in 1st April, 1950. He is an M. Com. in Accounting. He did his graduation from the University of Dhaka. Mr. Rashid has been serving The IBN SINA Pharmaceutical Industry Ltd. as Director from September 2016. 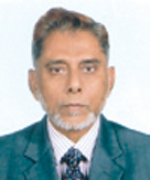 Formerly Chairman, Board of Directors of The Islami Bank Bangladesh Ltd.(IBBL), Chairman, Audit Committee and Chairman, Audit Committee, Islami Bank Foundation. About 35 years diversified experience in the field of business, finance and administration. 1. The IBN SINA Consumer Products Ltd.
4. Member, Board of Trustees, The Ibn Sina Trust.